Congratulations to Christi Positan, AMS MA ’13, on being hired as a Site Coordinator for Reading Partners in Washington D.C.. We wish her the best as she begins this exciting opportunity. 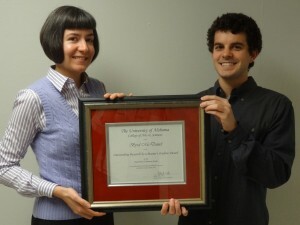 Congratulations to Byrd McDaniel, AMS MA ’13, on being awarded the 2012-2013 University of Alabama College of Arts and Sciences “Outstanding Research by a Master’s Student Award.” He is pictured here with his mentor, Dr. Jolene Hubbs. A Professor Northwestern University, Dr. Amezcua will deliver the lecture, “In the Business of Braceros: Pageants and Products for Mexican Workers in Mid-Twentieth Century Chicago” on April 16. Professor at University of Illinois, Champaign-Urbana, Dr. Loza will give the lecture, “I Was a Bracero: Indigeneity, Race, and the Bracero Program” on April 15. Congratulations to Vivian Lee Givhan, a former undergraduate student in Dr. Jolene Hubbs’s Fictions of American Identity course, on the publication of her article published in a top journal! It is with great sadness that the Department of American Studies notes the sudden and unexpected passing of our long-time colleague and Chair, Dr. James Salem on Friday, July 6, 2012. 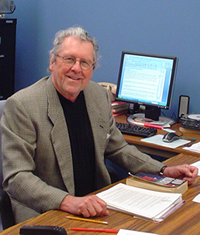 Jim served as a faculty member, nurturing generations of students and winning numerous teaching awards, for 43 years. For over 25 of those years he also served as Chair of the Department of American Studies, developing a nationally known program for which he won the American Studies Association’s Marie C. Turpie Award in 2007. He shared his love of American culture and music in numerous publications, particularly his award-winning book, The Late Great Johnny Ace and the Transition from R & B to Rock ‘N’ Roll.